A top notch leader: Rick Nelson. 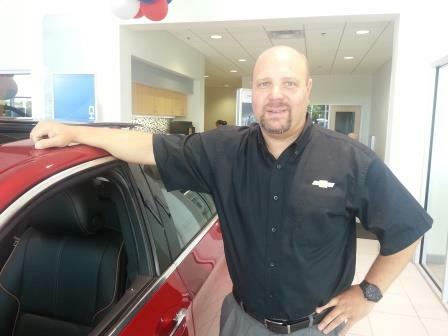 This month we recognize our +Heiser Chevrolet Cadillac General Manager, Rick Nelson. Known for his energetic personality, he’s always out to win over customers. One way he accomplishes this is by keeping an “open door” and remaining accessible to all. It is Rick’s love of meeting new people that keeps him on the showroom floor, often demonstrating product features and helping answer questions. Rick has been a dedicated Heiser Chevrolet Cadillac employee for over 15 years. He started in sales yet quickly rose to the top, wearing a great number of hats along the way. Rick can always empathize with employees and often helps coach them on improvement. He is seen as a versatile leader that understands the challenges and rewards of each sales role. His motto is “treat everyone the way you would want to be treated.” So, Rick encourages great service and revels in the outstanding online reviews the dealership receives. Oftentimes, customers talk about how comfortable they feel in the all-new Heiser Chevrolet Cadillac showroom: “It beautiful here and makes me feel special!” Considering the hours he puts in, Rick is happy customers feel at home here, too. Outside of the showroom, Rick enjoys his favorite sport: football. He’s also an avid gardener and has been known to throw together some pretty incredible meals, as head chef! With that variety of interests, you’d have to wonder how he landed in the automobile business. We figure it was that first car of his: a Cordoba with “Corinthian Leather”. Simply marvelous! We invite you to stop in and see Rick soon or email him at rnelson@heiser.com. The +Chevrolet Impala has morphed into the best sedan on the U.S. market with its latest redesign, according to Consumer Reports. The magazine, which has long tended to prefer offerings from Toyota and Honda over anything from the Detroit 3, awarded the 2014 Impala a road test score of 95 out of 100, tied with the Infiniti G37 for third-highest of any current vehicle. It's the first time since Consumer Reports began awarding cars and light trucks numerical scores in 1992 that a domestic car is the top-scoring sedan. "The domestic auto makers, they do a lot right but there's often something that's holding them back," Jake Fisher, director of Consumer Reports' automotive testing, told Automotive News, a sister publication of Tire Business. "This car just kind of gets it all right. They really have a winner here." In its September issue, Consumer Reports said the Impala "rides like a luxury sedan, with a cushy and controlled demeanor," and "is competitive with cars that cost $20,000 more, including the Audi A6 and Lexus LS 460 L," along with the Acura RLX and Jaguar XF. It also praises the car's "solid, almost vault like atmosphere" and the Chevrolet MyLink control system. "It has been transformed into a thoroughly modern and remarkably enjoyable vehicle," the magazine said. The 2014 Impala has also been widely praised by other publications, including the Wall Street Journal, Car and Driver, and Autoweek, another Tire Business sister publication. Only the Tesla Model S, which received a rare 99 out of 100, and BMW 135i coupe, which received a score of 97, rate better than the 2014 Impala. "GM's really put it all on the line," he said. "Gone are the days when GM said, 'We can't make the Chevy too nice because we have to sell Cadillacs.' They didn't hold back at all." 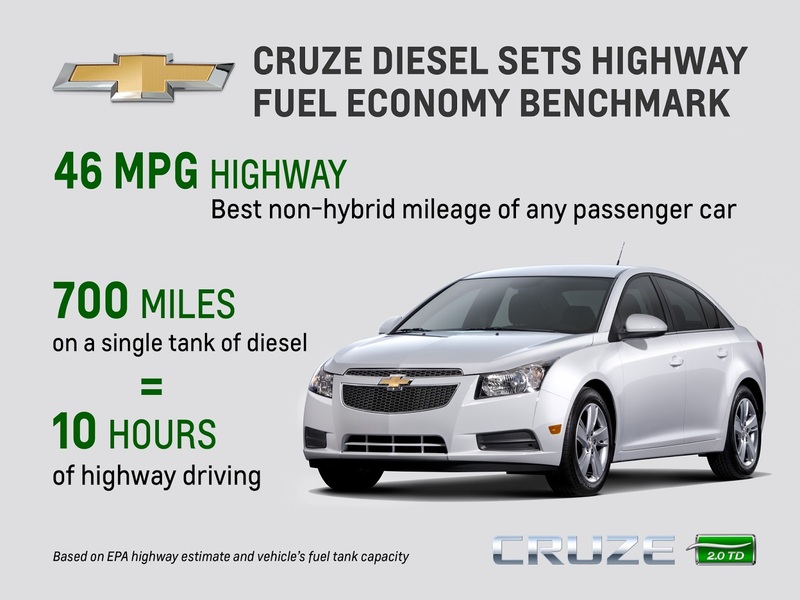 The new 2014 Chevrolet Cruze Clean Turbo Diesel delivers an industry best EPA-estimated 46 MPG on the highway – better than any non-hybrid passenger car in America. Equipped with a six-speed automatic transmission, the latest addition to the Cruze powertrain family has an estimated range of 700 highway miles on one tank of diesel fuel based on the EPA highway estimate and the vehicle’s fuel tank capacity. That’s about 10 hours of highway driving! The Cruze Clean Turbo Diesel is the best diesel passenger car on the market. With this car, Chevrolet is redefining the meaning of great fuel economy. With a starting price of $25,695, including an $810 destination charge, the Chevrolet Cruze Diesel is a better value than a similarly equipped VW Jetta TDI automatic. Compared with Jetta, the Cruze Diesel offers standard equipment including the Chevrolet MyLink infotainment system, larger 17-inch alloy wheels, leather-appointed seating, a longer five-year 100,000-mile powertrain limited warranty, and a two-year maintenance plan. Cruze Diesel also beats its rivals in performance with a segment-leading estimated 148 horsepower (110 kW) and estimated 258 lb-ft of torque (350 Nm), and can go 0-60 in about 8.6 seconds. Its advanced 2.0L turbo-diesel engine has an overboost feature capable of increasing torque to an estimated 280 lb-ft (380 Nm) for short bursts of stronger acceleration when needed, such as entering freeway traffic. 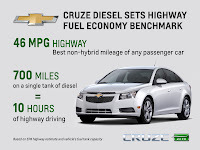 Cruze Diesel is powered by the cleanest diesel passenger car engine produced by General Motors. The vehicle generates 90 percent less Nitrogen Oxide (NOx) and particulate emissions when compared to previous-generation diesels. Chevrolet has sold more than 2 million Cruze models globally since it was launched in mid-2010. More than 35,000 of those were diesel powered in 2012. The Chevrolet Volt, already recognized by for having the most satisfied owners will soon come with another people pleaser: a lower price. The 2014 model will start at $34,995, including an $810 destination fee (excluding tax, title, license and dealer fees). If consumers include federal tax credits ranging from $0-$7,500 (depending on individual tax liability), pricing could start at $27,495. Individual tax situations differ so consulting a tax professional prior to claiming any credits to confirm eligibility for vehicle tax benefits is recommended. Environmentally conscious drivers really love the Volt. 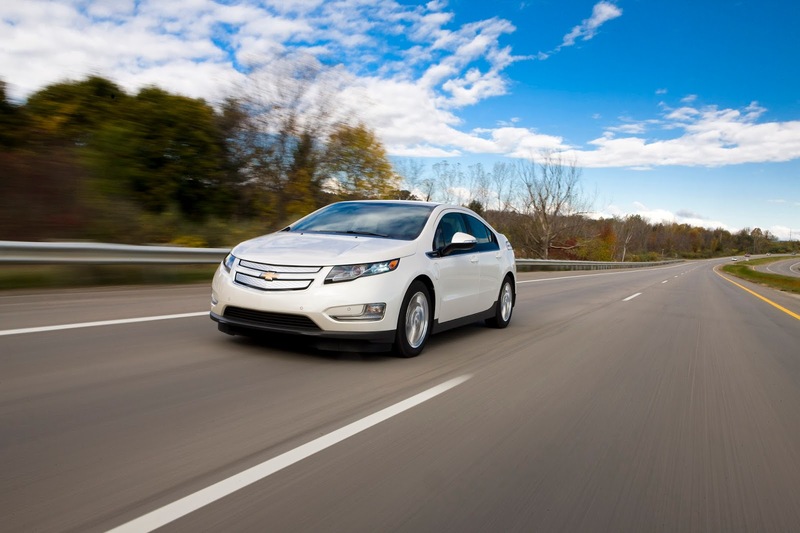 By reducing the cost, Chevrolet has made the Volt a viable option for many more consumers. Volt owners who charge regularly typically drive 900 miles between fill-ups and visit the gas station about once a month. The 2014 Volt will continue to provide impressive fuel economy of 98 MPGe (electric) and 35 city/40 highway on gasoline power without any need to change their daily driving habits while saving $900 in annual fuel costs. The Volt continues to be the best selling plug-in vehicle in America and is attracting new buyers to Heiser stores and the Chevrolet brand. More than 70 percent of Volt buyers are new to General Motors. Not surprisingly, the Toyota Prius is the most frequently traded-in vehicle for a Volt. The Chevrolet Volt allows gas-free driving for an EPA-estimated 38 miles, depending on terrain, driving techniques and temperature. The range-extending engine gives the Volt up to 380 total miles of total driving range. With the 2014 Volt, Chevrolet will introduce two new colors – Ashen Gray Metallic and Brownstowne Metallic – and a leather-wrapped steering wheel. Chevrolet’s globally recognized bowtie celebrates its 100th anniversary this year with 25 product launches helping the symbol find new roads around the world despite an origin that is still uncertain. In 1913, Chevrolet co-founder William C. Durant introduced the signature Chevy bowtie on the 1914 Chevrolet H-2 Royal Mail and the H-4 Baby Grand, centered at the front of both models. Sixty million Chevrolets are on the roads worldwide today and the bowtie has adorned 215 million Chevrolets over the last century. A Chevrolet car, crossover or truck is sold every 6.39 seconds in one of 140 countries, and the brand set a sales record of 2.5 million in the first six months of this year. The bowtie’s centennial is marked by new entries, such as the Cruze Clean Turbo Diesel compact sedan in the U.S. While the bowtie has been present for 100 years, the details surrounding its origin are still uncertain. Stories range from Durant being inspired by the wallpaper design in a Parisian hotel to a newspaper advertisement he saw while vacationing in Hot Springs, Va. Durant’s widow and daughter have offered alternative explanations. According to Margery Durant, in her 1929 book My Father, Durant sometimes doodled nameplate designs on pieces of paper at the dinner table. "I think it was between the soup and the fried chicken one night that he sketched out the design that is used on the Chevrolet car to this day," she wrote. Unfortunately, Mrs. Durant never clarified what the motif was or how it was used. But that nugget of information inspired Ken Kaufmann, historian and editor of The Chevrolet Review, to search out its validity. In a Nov. 12, 1911 edition of The Constitution newspaper, published in Atlanta, an advertisement appeared from by the Southern Compressed Coal Company for “Coalettes,” a refined fuel product for fires. The Coalettes logo, as published in the ad, had a slanted bowtie form, very similar to the shape that would soon become the Chevrolet icon. Did Durant and his wife see the same ad – or one similar – the following year a few states to the north? The date of the paper Kaufmann found was just nine days after the incorporation of the Chevrolet Motor Co. The first use of the bowtie by Chevrolet appeared in the Oct. 2, 1913 edition of The Washington Post with the words “Look for this nameplate” above the symbol. Many drivers sing in their cars, but few sound as good recording a song as the lead singer of Detroit-based blues-rock band The Gentlemen Mutineers. 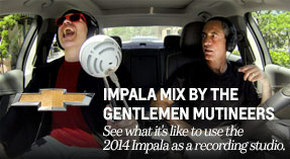 In fact the 2014 Chevrolet Impala was used as a “mobile studio” to record an “Impala Mix.” To showcase the Impala’s quiet design, the lead singer was recorded onto a laptop computer from inside the vehicle. In addition to the chorus, the band also recorded harmonica and trombone tracks in the car for the song. Bustling city sounds, such as construction noise proved practically inaudible inside the Impala. Impala customers cannot believe how quiet the Impala is, especially when we they hear a band recorded a song inside the cabin. 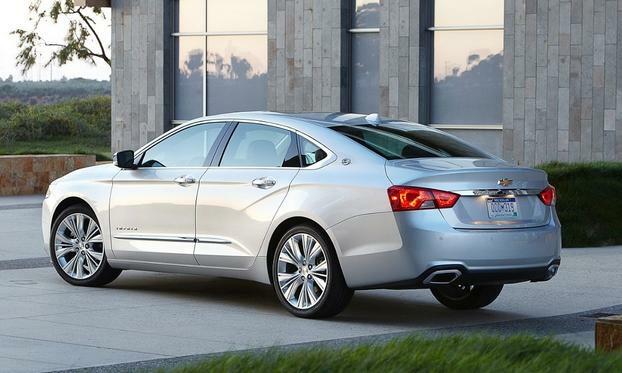 The new 2014 Chevrolet Impala is quiet by design, due in part to active noise-cancelling technology. Active Noise Cancellation is standard on new Impalas with four-cylinder powertrains and helps make the redesigned flagship Chevrolet’s quietest full-size sedan ever for drivers. Active noise cancellation even helps owners of the new Impala save money at the pump by using three ceiling-mounted microphones to detect low frequency engine noise during idling. The frequencies are processed by an onboard computer that directs counteracting sound waves through the audio system’s speakers and subwoofer. This technology allows the engine to operate at the fuel-conserving range of 1,000 to 1,500 RPM, and helps eliminate the need for some sound-deadening materials, all of which contributes to improved fuel efficiency. · And an isolated engine cradle. Having a quiet cabin makes it easier for Impala’s voice recognition software to understand commands. A quieter cabin also makes it easier for front and backseat passengers to have a conversation at normal speaking levels. Voice recognition is part of the MyLink system that comes standard on LT and LTZ models, and helps drivers safely place calls, enter destinations and control other functions while keeping their eyes on the road and hands on the wheel. To make the Impala as quiet as possible, engineers tested the Impala’s interior acoustics with a mannequin-like binaural recording device called an Aachen Head. Named for the headquarters of Head Acoustics GmbH in Aachen, Germany, the tool uses specially calibrated microphones to precisely record a dynamic range equal with human hearing during test drives on a variety of road surfaces at GM’s Milford Proving Ground. The 2014 Chevrolet Impala has received the highest possible five-star Overall Vehicle Score for safety as part of the National Highway Traffic Safety Administration’s New Car Assessment Program. Safety is a big concern for car buyers. The new Impala is designed with quite a few new safety technologies, to provide excellent crash safety. The redesigned, full-size sedan presents drivers with one of the most comprehensive collections of standard and available safety features in the segment. It employs advanced technologies – including radar – to help avoid crashes. Visual and audible alerts, depending on the alert feature, help drivers identify potential crash situations and even intervene when a crash threat appears more imminent. The alerts are designed to identify potential threats with sufficient warning to give the driver time to react and make changes. · Full-speed-range adaptive cruise control – Radar technology senses traffic in front of the Impala to adjust vehicle speed, including stopping the vehicle in heavy traffic and accelerating again. It is the first application in a Chevrolet. 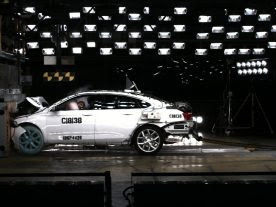 · Crash imminent braking – Another Chevy first: Radar technology detects a possible crash threat and alerts the driver. If the driver does not appear to react quickly enough or doesn’t react at all, this feature intervenes to apply the brakes in an effort to avoid the crash. · Forward collision alert – Camera technology detects a possible crash threat and alerts the driver, giving him or her time to stop and/or change course. · Lane departure warning – A camera-based lane detection system warns the driver of unsignaled lane changes. The camera, mounted near the inside rearview mirror, identifies traffic lane markings and provides audible alerts. · Side blind zone alert – Using radar sensors on both sides of the vehicle, the system “looks” for other vehicles in the blind zone areas of the Impala and indicates their presence with light-emitting diode, or LED-lit symbols in the outside mirrors. · Rear cross traffic alert – Based on the radar sensors of side blind zone alert, it warns the driver of vehicles in traffic when backing out of a parking spot – including angled parking. Visual and audible alerts are triggered if moving vehicles are detected. · Rear vision camera with dynamic guidelines – With a display in the center stack infotainment system, the camera provides a view of objects directly behind the Impala, while the dynamic guidelines provide a reference that helps make parking and other maneuvers easier. · Ultrasonic rear park assist – Uses sensors in the rear bumper to detect objects directly behind the vehicle and alerts the driver. · Brake pre-fill feature – To quicken the response time of the brakes and help shorten stopping distances, this features “loads” the brake calipers in anticipation of hard braking by slightly increasing the hydraulic pressure in the brake lines whenever the driver lifts off the accelerator pedal. This feature is included on models equipped with adaptive cruise control and collision mitigation braking. · Hill hold/start assist – Applies the brakes for about 1.5 seconds to prevent roll-back when the driver moves his or her foot from the brake to the accelerator pedal. The advanced, crash-avoidance technologies complement the Impala’s occupant protection features that keep owners safe, including 10 standard air bags. Impala also employs systems that enable greater vehicle control, including standard StabiliTrak electronic stability control system, all-speed traction control, four-wheel disc brakes with four-channel antilock brakes and electronic brake force distribution, which ensures optimal braking force at both axles for maximum stability under heavy braking. OnStar is standard. It uses GPS and cellular phone technology to automatically call for help in the event of crash. OnStar service also includes MyLink mobile apps, which offer vehicle information and OnStar services via the customer’s smartphone.